DNA thermometers; measuring polaritons; deadweight machines. The University of Montreal has taken DNA and built the world’s smallest thermometer. The programmable DNA thermometer is 5nm, or 20,000 times smaller than a human hair. Applications for the technology include cell imaging, nanofluidics, nanomedicine, nanoelectronics and synthetic biology, according to the University of Montreal. Researchers added optical reporters to DNA structures. The 5nm-wide structure can detect a signal as a function of temperature. The DNA thermometer or thermoswitch can enable temperatures over an interval of ±0.05 °C. It can also provide a wide temperature range from 25 to 90 °C. Alexis Vallée-Bélisle, a professor at the University of Montreal, added: “There are still many unanswered questions in biology. For example, we know that the temperature inside the human body is maintained at 37° C, but we have no idea whether there is a large temperature variation at the nanoscale inside each individual cell. 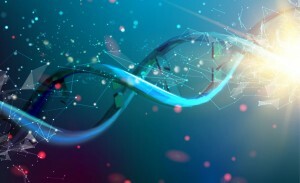 “In the near future, we also envision that these DNA-based nanothermometers may be implemented in electronic-based devices in order to monitor local temperature variation at the nanoscale,” Vallée-Bélisle said. Using X-ray metrology techniques, DESY, ESRF, Helmholtz Institute and the University of Jena have measured polaritons. Classified as a quasiparticle, a polariton is the result of the mixture between a photon and an excitation of a material. Polaritons can be used to develop a new type of source of laser light. The idea is to transfer this technology to the field of X-rays. Polaritons could enable a new type of narrow-band X-ray lasers for use in spectroscopy applications. In 2014, the University of Michigan developed the world’s first polariton laser. It is fueled by electrical current as opposed to light. It works at room temperature. The key to develop this technology is to measure polaritons. In the lab, researchers from DESY and others devised a material stack. The stack consisted of alternating layers of iron-57 and non-resonant iron-56. Then, X-rays from a synchrotron source are directed at an array of atoms. With a novel detection method, researchers measured two new resonances. These resonances can be attributed to the creation of polaritons. They were separated by 37.3 nano-electronvolts. The National Institute of Standards and Technology (NIST) has completed the restoration of its 4.45-million Newton deadweight machine. NIST started the restoration process last year. 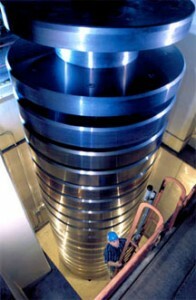 NIST’s deadweight machine, the largest of its kind in the world, is equivalent to one million pounds-force. Built in 1965, the deadweight system consists of a stack of 20 stainless steel discs about three meters in diameter. The average mass of the disc is about 22,696 kg, or just over 50,000 pounds, each. A deadweight machine is a mechanical structure that generates force by subjecting deadweights to the local gravitational field. Deadweight machines are used for the precise definition of the force scale. NIST’s machine is used by aerospace manufacturers, military laboratories and others. It is used to perform various calibrations.